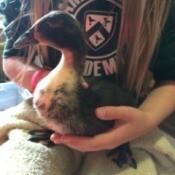 Information about raising and caring for pet ducks. Small Duck Pond with RampMy husband created this neat little pond for our duck, using a mortar mixing tub and scrap wood that we had laying around. It has a frame to hold the tub and a built-in ramp. With only one duck, is it easy to clean and refresh the water. Our Runner Ducks (Week 6)The main event this week was moving day! We purchased a large dog run at Costco and are working on modifying it so that it protects them from predators. 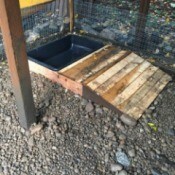 We placed the placed the dog run on pavers, in part to level the area and to help with predators. Our Runner Ducks (Week 3)Our runner ducks are now 3 weeks old and have grown up so much. They seem to get taller by the minute and have distinct personalities. I am totally in love, which is good because they are ridiculously stinky! 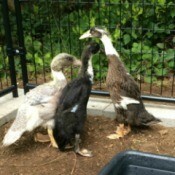 Our Runner Ducks (Weeks 7 and 8)We officially have grown up ducks. There are little to no baby feathers on any of them, although the dark one has a funny little mohawk of baby feathers running down its neck still. They seem to have settled into their new home. Our Runner Ducks (Weeks 4 and 5)Our ducks are getting bigger and stinkier by the day! They are definitely outgrowing the pen in the garage and will be moving outside very soon. They really need more space and a bigger pool of water to play in. Stock Tank Duck PondMy husband finally had a chance to make our ducks a permanent pond. It has an awesome gravel ramp and a faucet drain to make water changes super easy! Duck Not Sitting on EggsMy magpie duck has laid 16 eggs one every day since January 1st, but she doesn't sit on them. She is only a year old. Will she sit or should I collect them? Moving Duck EggsMy duck laid 2 eggs on my neighbor's pouch. It has now laid one egg on my balcony. Which I think was because she didn't have a way off of the balcony where I her wanted to lay her egg. What do I do? Which should I move to add to the other? Pekin Duck Hen Has Laid EggsShe has 8 eggs in her nest. I understand what you said about when she will start sitting. My question is when do the eggs start progressing? From day 1 or when she starts sitting full time? Moving With a Pet Nesting DuckWe have 4 ducks we bought as they where young. 1 has laid 8 eggs and is nesting at this point. We will be moving at the end of the month. Will she still care for the eggs? We will be taking them with us as we move. They are tame ducks not wild so I wasn't sure if she would still care for them.